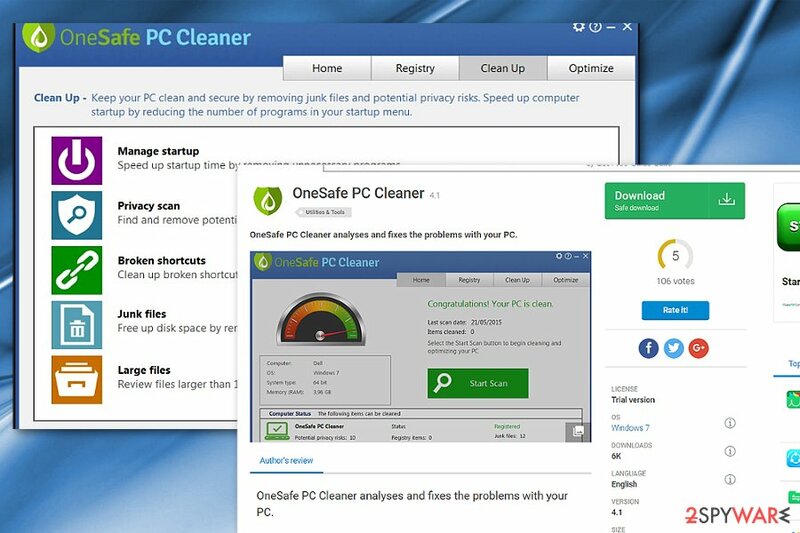 OneSafe PC Cleaner is a fake system optimization program which is created to trick users. This rogue application seeks to convince its victims to buy the full version of the application in order to "fix" all system problems. Do not fall for these fake promises, better delete the program automatically. 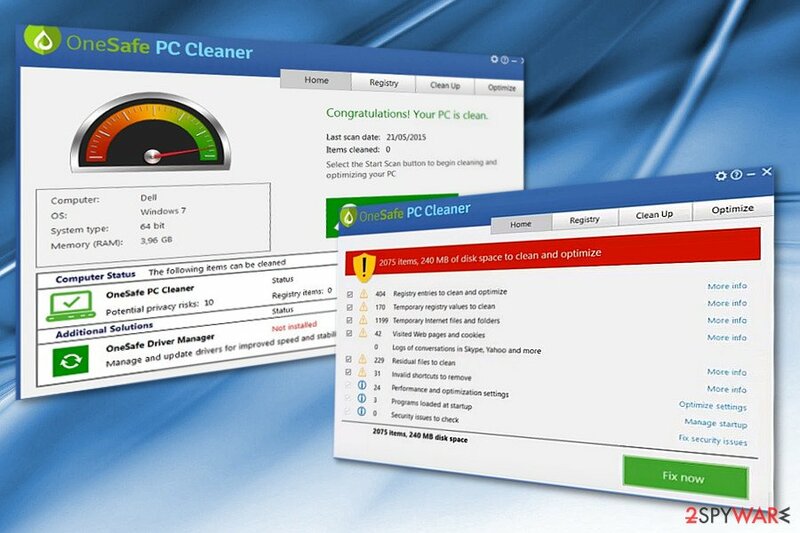 OneSafe PC Cleaner operates as a tool which supposedly helps users fix and correct Windows errors with one click. However, such promises are far from reality. In other words, this system optimization tool can cause more new problems with your computer than help you get rid of the existing issues. It is wise to mention that there are more similar and unreliable software like One Safe PC Cleaner. Be aware that their appearance and description might deceive many users, including you. Developers of such programs aim to trick naive people into believing that their software is useful. Unfortunately, the real answer to the question what is OneSafe PC Cleaner and similar applications can disappoint you; In reality, the absolute majority of system optimization tools are programmed to alarm victims about dozens if not hundreds of fake computer-related issues. As for the solution, such fraudulent software offers to purchase its full version to solve the detected issues. When a user buys the licensed version, the program magically solves them. However, if you would have checked the system earlier with reputable antivirus, you would have noticed that there were no issues similar to ones provided by One Safe PC Cleaner. Such phishing technique has led hundreds of users to get caught in a marketing trick and suffer from money loss. While the majority of optimizers such as OneSafe PC cleaner and other similar ones happen to be just useless programs created for an extortion purpose, some samples might even cause cyber issues. Some of the latter might make the operating system more vulnerable to virtual threats, while others, such as Windows Antivirus Helper, might even interfere with legitimate system apps and anti-virus programs and diminish their operation. While such programs have been online already for several years, recently, Microsoft and other cybersecurity institutions have been paying more attention to this rooted cyber phenomenon. Likewise, OneSafe PC Cleaner tool happens to be one of such fake tools. It does not have its own website but instead is promoted at the notorious Softonic domain, which has a low reputation due to insecure content it promotes. OneSafe PC Cleaner is a fraudulent system optimization tool which delivers fake malware alerts to make users purchase its full version. 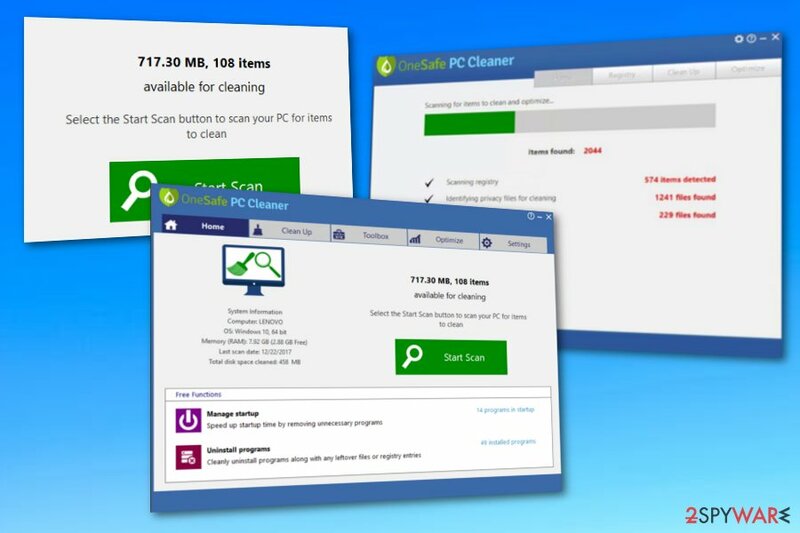 Even though such honest OneSafe PC Cleaner review might make the developers of this program dissatisfied, we want to raise awareness that not every software online which has a well-constructed description is worth users' trust. It is important to make a good research about the program you attempt to download and choose only reputable distribution sources. For all the reasons mentioned above, we strongly advise you to stay away from so-called OneSafe PC Cleaner virus. However, despite whether you have manually installed this program or it has sneaked into your system via software-bundles, you should immediately uninstall it if you notice its presence. If you keep the rogue app for a long time, it may start bombarding your desktop with various pop-ups that might cause system slowdowns and intrude your computing work. Be aware that after the installation, the scan only takes a couple of minutes until it immediately displays over a thousand issues. Instead of paying $19.99 for this fake tool, proceed to OneSafe PC Cleaner removal. Once you get rid of the fake system optimization program, make sure that you consider downloading and installing a truly reliable computer security tool that will prevent installation of various dubious applications and even dangerous malware. However, if you are not experienced enough, we suggest you remove OneSafe PC Cleaner virus with a malware removal tool. You can do that by scanning the system with Reimage. Automatic elimination of this program will save your time as well as ensure that all its components will be deleted from your system. However, if you want to proceed with the elimination on your own, scroll down the article and find some helping guidelines that will let you deal with the process correctly. Similarly to other unreliable system optimization tools, this one is available at the official Softonic's website for free. However, developers try to infiltrate this potentially dangerous software secretly by using deceptive distribution techniques. One of them is bundling it with other free third-party applications and offering as one. Likewise, people who tend to rush through the installation procedure are most likely to end up with fake PC optimizers on their systems. However, there is an easy way how you can avoid downloading additional software during the installation of freeware. The secret is to choose Custom or Advanced settings of the installer. Later on, unmark all add-ons. Rarely useful apps are promoted likewise. Note that some developers even promote their products via online tech support scam sites. If you got redirected to a site which claims that your computer is heavily infected with Zeus virus or another malware and asks to call a specific phone number or purchase a tool, exit it. We can offer you two ways to remove OneSafe PC Cleaner virus from your system. First one is to follow manual elimination guidelines at the end of this article and try to get rid of this PC optimizer by yourself. However, it is wise to know that this method will require your time and attention but if you complete it correctly, it should bring you expected results. Therefore, we suggest an easier way to get rid of OneSafe PC Cleaner — download professional malware removal software. You can either pick one from the list below or get one of your choices. According to ZonderVirus.nl team, it is only important to choose a reliable program which will not be used to swindle money from you by offering useless services. Start OneSafe PC Cleaner removal by downloading the antivirus from a reputable source. Use a direct link if possible and install it on your system. Later, run an entire computer scan and let it eliminate this shady software from your system. Automatic termination should not cause any trouble. However, if you have any questions, feel free to contact us. Be aware that OneSafe PC Cleaner removal will only succeed if you will eliminate both, the unreliable program and its elements from your Windows system. Here, look for OneSafe PC Cleaner or any other recently installed suspicious programs. ^ Windows. Computer hope. Free computer help since 1998. ^ Microsoft support policy for the use of registry cleaning utilities. Microsoft Support site. ^ Jeff Roberts. 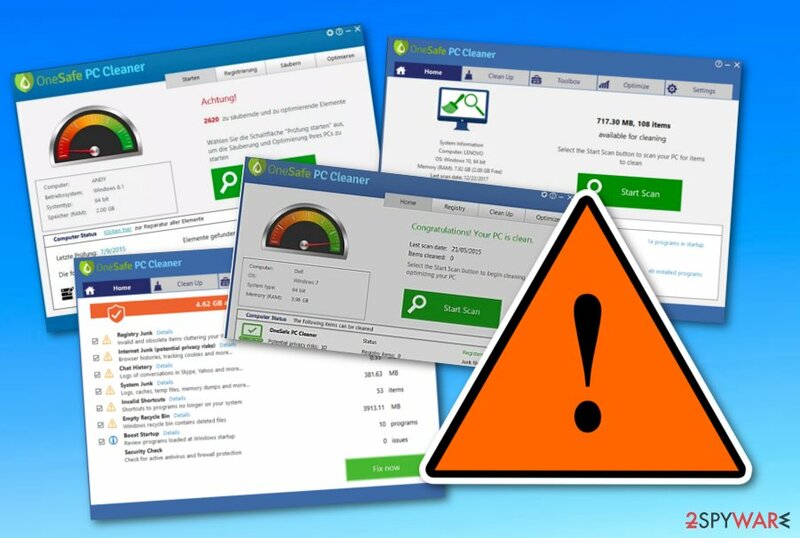 FTC shuts down massive “PC cleaner” scam. Gigaom. The industry leader in emerging technology research. ^ Bundled software. Webopedia. Web terms and definitions. ^ Bash K. Osman. What is Softonic and is it safe?. Quora.com. Questions and answers. ^ Eliminate computer threats. Zondevirus. Cybersecurity news in Dutch. This entry was posted on 2019-04-01 at 02:06 and is filed under System tools, Viruses. You can quickly scan the QR code with your mobile device and have OneSafe PC Cleaner manual removal instructions right in your pocket. How did you remove OneSafe PC Cleaner?